Taught by 5th degree black belt, Marco Nascimento, this class is appropriate for all belt and skill levels. Marco's flexible teaching style allows him to demonstrate basic techniques for beginners, while still challenging advanced students with the more technical variations of the same technique. Our classes have a wide variety of belt and skill levels. Higher belts are encouraged to train with beginners to help them put the technique into practice. It's never too late to start! Our school welcomes and is made up of men and women of all ages. We also have morning, lunchtime, evening and weekend classes to accommodate all schedules. Check out our schedule [here]. Our advanced class focuses on putting the fundamentals into practice through sparring and competition preparation. This class is for green belts and higher. For safety, white belts should check with Marco or another instructor before sparring. In addition to our co-ed fundamentals class, we also offer a women's only fundamentals class. 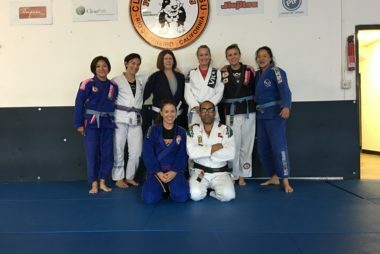 This class is structured to achieve maximum comfort for females interested in pursuing Brazilian Jiu-Jitsu in a non-threatening training environment. It is ideal for the beginner female student to learn among other beginner and experienced female teammates. Our No Gi classes offer a faster and more dynamic style of fighting. Students will learn basic techniques including takedowns, position controls, position escapes and submissions and self-defence techniques.